No prep time: No fussing with your dog to get ready for a day at the groomer. The groomer comes to you! No driving to the groomer: With door-to-door service, there is no need to track down a car to take your dog from the city to the groomer. No need to find parking. No stress or car sickness for your dog. Sparkling clean: We clean the spa thoroughly between dogs and between visits. Do not worry about sharing cages or germs. 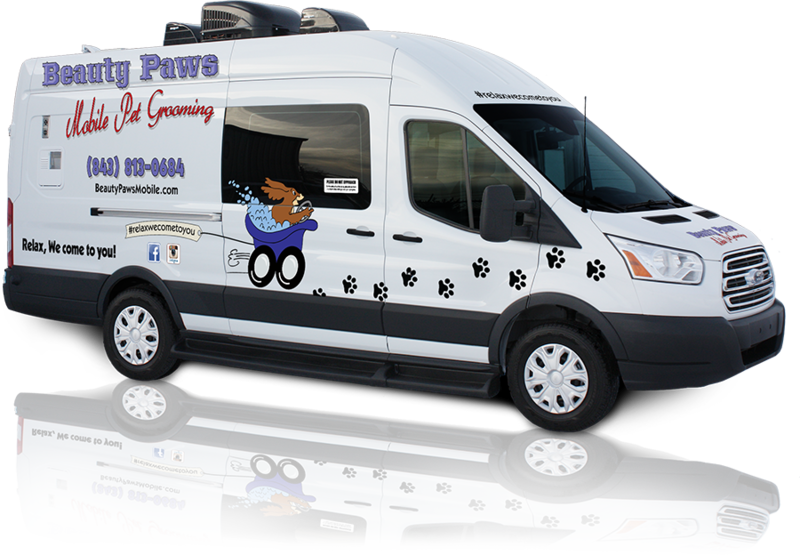 Stress free environment for your dog: We groom right outside your home in a crate-free spa. Your dog receives individual grooming attention for the whole visit. Self-sufficient spa at your doorstep: We do not use your electricity or water. The spa is completely self-sufficient. Individual attention: All packages include an individual consultation where the groomer and your pet can get to know each other before the styling begins. We will discuss all aspects of grooming from coat and skin, to personality, to style! Your groomer will work with you to select a look that works for both you and your dog. A long term relationship: Our staff takes pride in caring for your family. See What's New on Facebook!